We have all been there – at least I have on many occasions. It’s 5:30pm and I have just walked in the door and I immediately here “I’m hungry”, “What’s for dinner?”, “I’m starving!”. Of course, after a long day that is the last thing you want to worry about is what to do about dinner. Whether you are coming home from work after a long day or coming in after shuttling kids to after school activities, we have enough stress in our lives without having to worry about dinner every night. Over the last month, I have created a series of posts that will give you some essential tips on how to have stress free weeknights when it comes to dinner. Not only will they make dinner time less stressful for you, but more enjoyable for everyone! I can say that I have put these together from my own personal experience and they really did help to ease the stress surrounding dinner time. I hope you will find them just as helpful. This is probably the most important part of ending the stress with weeknight meals – planning! I sit down the night before I go to the grocery store and I plan out the meals for the next week. I look at our schedule to see if I have any crazy nights coming up or events and I plan accordingly. I then make my grocery list based on my menu plan and the staples that we purchase every week. This is the single most important thing that I do to keep the stress down. For more information, click on the picture below! I can not emphasize enough how important my freezer is for me! I often make soups and chilis in the winter and they make more than one servicing so I place the excess in the freezer for when I need it. Whether you want to work with freezer meals or just make a few things here and there that you have waiting in the freezer, it can really help you when you are in a bind and need dinner on the table! This post will give you 5 quick weeknight meals to add to your menu and get dinner on the table fast. This is a great list to get you started and then add to it with more of your families favorites! The crockpot can be a lifesaver! What could be better than putting all the ingredients in the pot in the morning and then when you get home, dinner is ready or almost ready to be on the table! I have a collection of 9 crockpot recipes to get you started and I keep a lot of crockpot recipes on hand to make my meal planning easier and getting dinner fixed much easier! As with any plan, there are times when the day just goes downhill and nothing goes according to the plan. I know this happens at least a few times a month at my house due to my health or other life issues. I keep backup meals on hand to make sure that we don’t have to order pizza or get take out fast food. Backup meals are quick meals that you can prepare without hardly any effort, like spaghetti, ravioli, hot dogs, tortillas and shredded chicken for quesadillas, etc. I have some great ideas of backup meals in this post. Click the picture below! 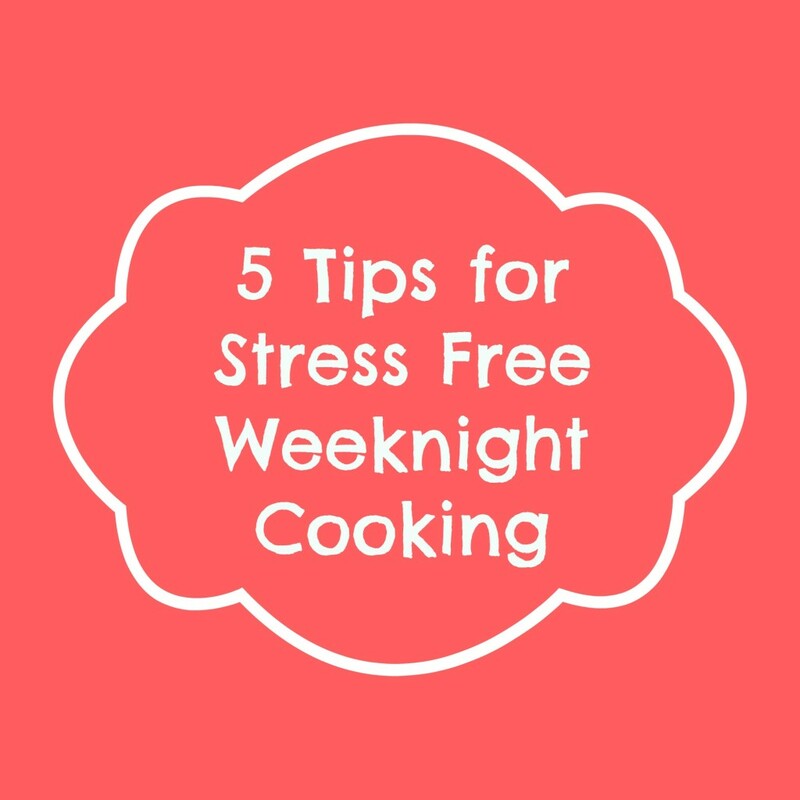 I hope that these tips will help you to end the stress of weeknight cooking and to enjoy sitting down to dinner with your family. I know they have made a huge difference for me and my family. Would love to hear your feedback – what are some of your favorite meals or tips! Connect with me over on Google+ and share your thoughts! Meal planning is my issue. I really hate trying to come up with ideas for dinner everyone will like. Laina – I know it can be hard at times especially if you have picky eaters in the family like me. I normally try and pick a few dishes that I know the kids will eat and then on nights when I fix something they won’t – they have cheese rollups or sandwiches and all are happy. I keep all my recipes in one binder to make it easier to go through them. I also keep a binder of recipes to try that I have printed off from my collection on Pinterest. That seems to help a lot. My biggest time savers for week day meals are freezer, crockpot, and backups. And when I do cook the on the stove, I always, always cook a double batch for the freezer, or for the next day! Great tips, I agree with you on every single one of em! And they are fabulous time savers. We used up my stock of freezer meals so it’s time to build them back up! Thanks for sharing with #smallvictoriessunday. Pinning and sharing!